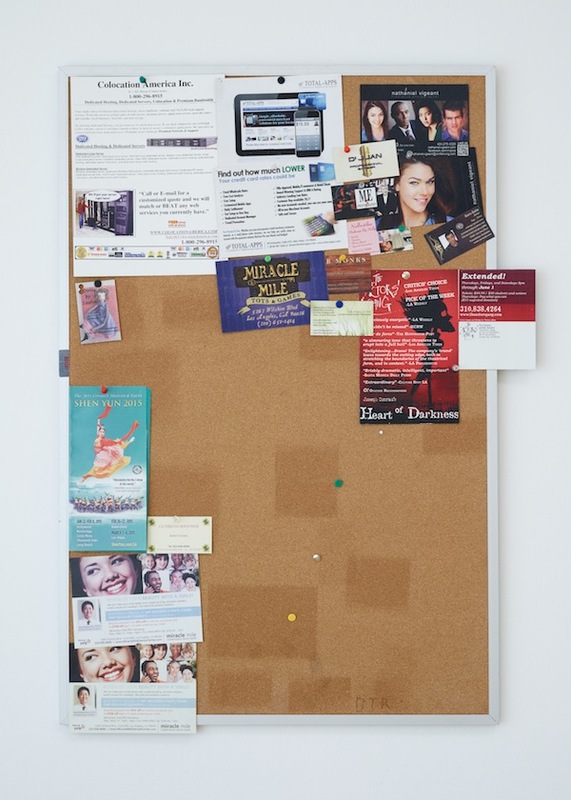 Bulletin boards are a self-organizing format whose content is determined by its immediate community. 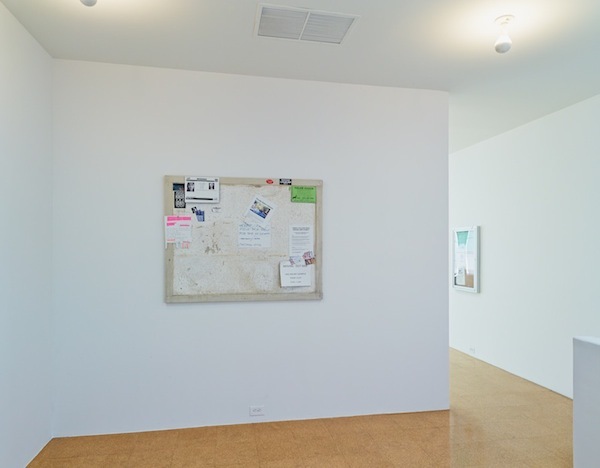 In Fiona Connor's 1:1 scaled re-makes, paper ephemera and material from bulletin boards from across Los Angeles are reproduced in durable materials; each coffee stain and tear precisely emulated in a composed pretense of reality. 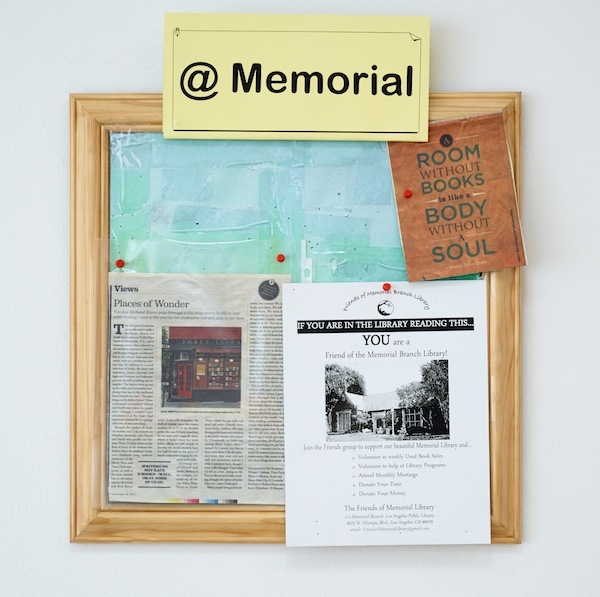 The programs, fonts and materials used to present notices and information to the public are temporal proof of a particular moment and location of visual vernacular. 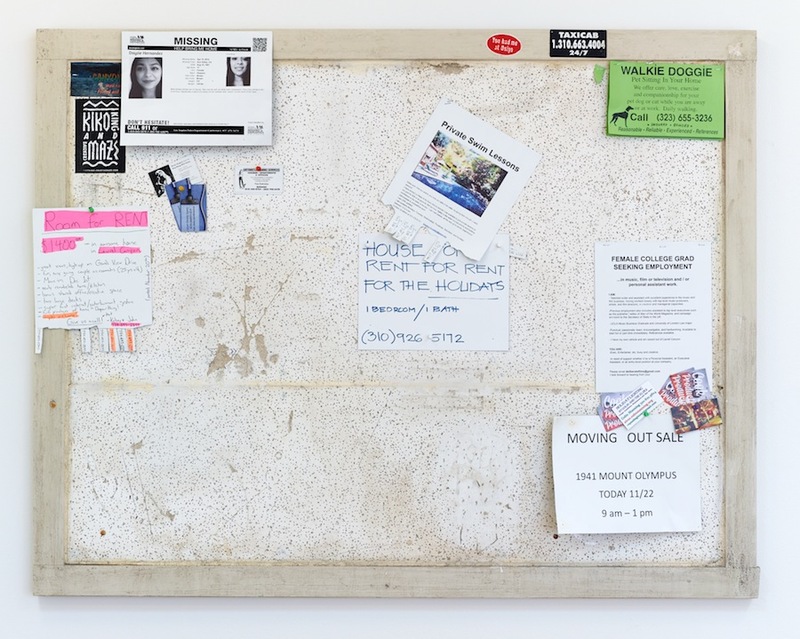 Diverse fabricated elements reflect the collage nature of the notice boards; some being cobbled together from recycled materials and offcuts, others, purchased off the shelves of office supply stores. 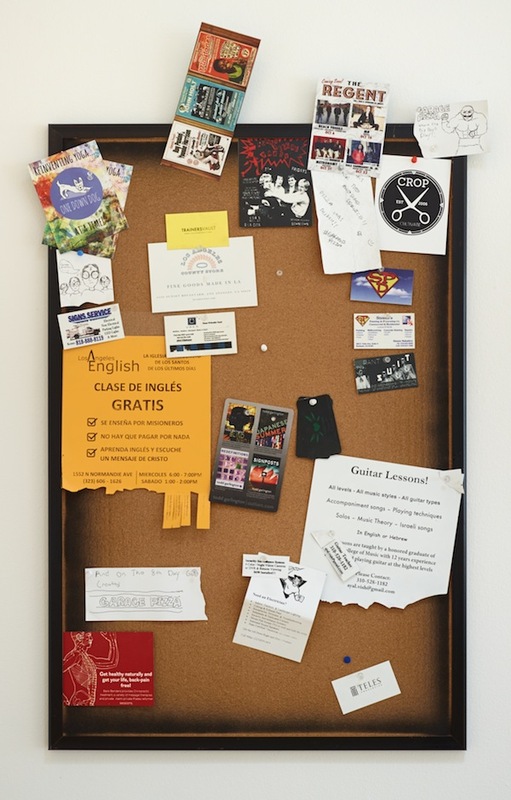 "Bulletin boards are the perfect content generators, because they are responsive, active, social, and temporal." Connor draws attention to unseen but crucial support systems, which have in large part migrated to the Internet. Phrases like 'message board' and 'forum', commonplace in the digital world, connect communities by interest, as opposed to physical location. What happens in the transition between these sites? 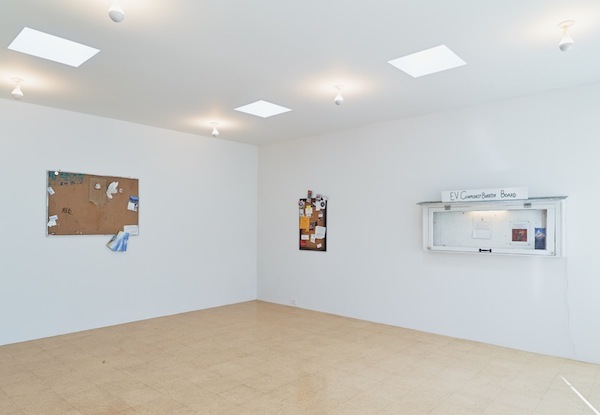 What are the ethical implications of appropriating intellectual or creative property, and exhibiting it in a commercial gallery? 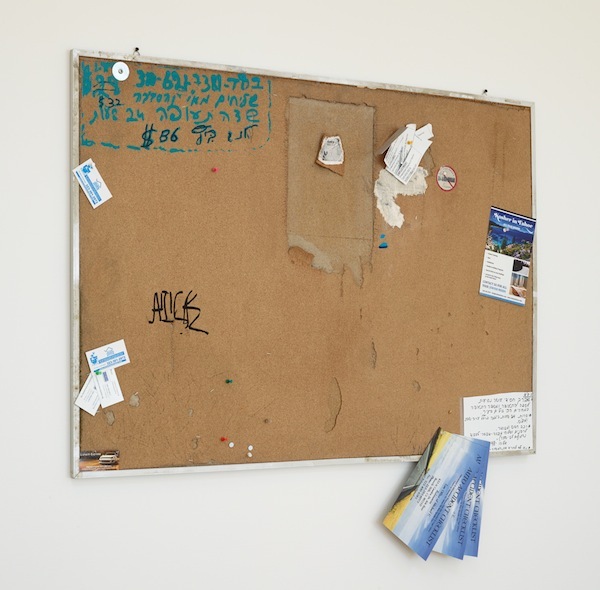 In the tradition of Situational Aesthetics and Appropriation Art, Community Notice Board juxtaposes pre-determined elements that occur within the institutional framework, recognizable because they are drawn from the institutional system itself. In translation from original site to gallery, the models, images, and codes of the hyperreal are awarded distance for thought and examination. Fiona Connor lives and works in Los Angeles. 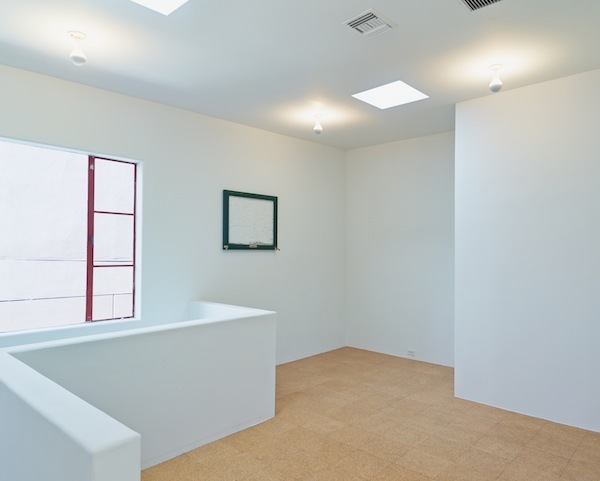 She was included in the first and second Los Angeles biennial, Made in L.A. 2012 and 2014 at the Hammer Museum. She just completed a major residency and exhibition Wallworks at Monash University in Melbourne, Australia. 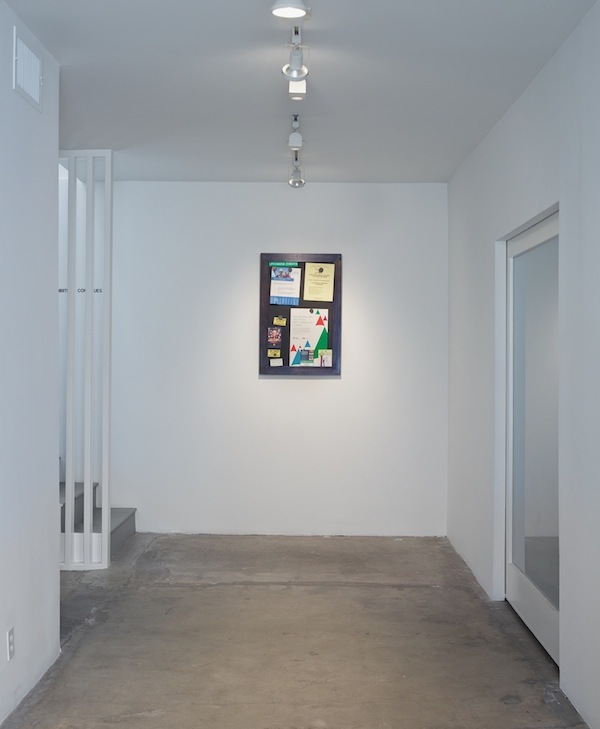 Her 2010 solo show Murals and Print was the inaugural exhibition at Various Small Fires, Los Angeles. 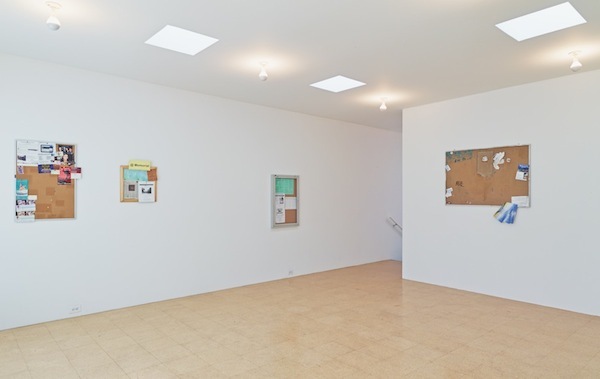 Recent museum group exhibitions include TL;DR at ARTSPACE, Auckland, New Zealand; Gap, Mark, Sever and Return, Human Resources, Los Angeles; Concrete Situations, Pact, Essen, Germany; Experimental Impulse, REDCAT, Los Angeles; and Octopus 8, Gertrude Contemporary, Melbourne, Australia. In 2010 she was a finalist for New Zealand's most prestigious contemporary art award, the Walters Prize.